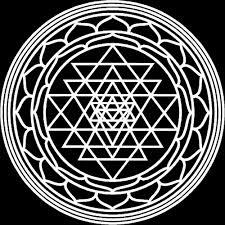 "Sri yantra, also known as Sri Chakra, is called the mother of all yantras because all other yantras derive from it. In its three dimensional forms Sri Yantra is said to represent Mount Meru, the cosmic mountain at the center of the universe. Man's spiritual journey from the stage of material existence to ultimate enlightenment is mapped on the Sri Yantra. The spiritual journey is taken as a pilgrimage in which every step is an ascent to the center, a movement beyond one's limited existence, and every level is nearer to the goal. Such a journey is mapped in stages, and each of these stages corresponds with one of the circuits of which the Sri Yantra is composed from the outer plane to the bindu in the center. The goal of contemplating the Sri Yantra is that the adept can rediscover his primordial sources. The circuits symbolically indicate the successive phases in the process of becoming."